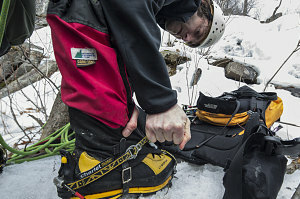 Today (Friday, March 29), I joined Roland and Sara for a spring ice climbing session at a cliff not far from Ottawa, Canada. 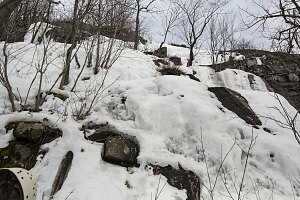 The location was the Eardley Escarpment, a roughly 30-km long dropoff that forms the southwestern boundary line of Gatineau Park. 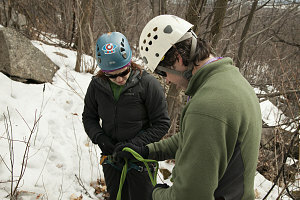 More specifically, we headed to a climbing location along the escarpment known as "Heffalump" (origin unknown). Roland had been to this spot nearly a decade before, and wished to return. As an ice-climbing destination, Heffalump is quite tame. It mostly consists of 45-degree angled slopes. At it's lower end, it consists of interspersed short terraces and vertical sections. We started out under grey and drizzly skies from the closed gate at the Lusk Falls Trailhead area (in the summer, the gate allows access to a parking area a few hundred metres farther in). 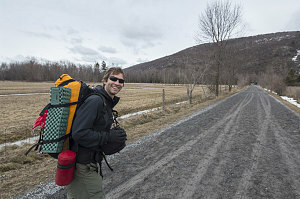 We walked along the access road and started north-west, along a main footpath that runs along the base of the Escarpment (note that this is different than the trail which heads up the escarpment, past Lusk Falls). 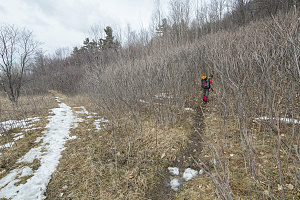 Approximately 1.3 km in from the parking lot, a well-defined footpath heads off right through a thick stand of bushes. 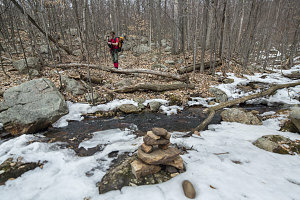 Above the bushes, a trail with a rocky and uneroded tread led upwards. Suprisingly, the trail was mostly brush-free. 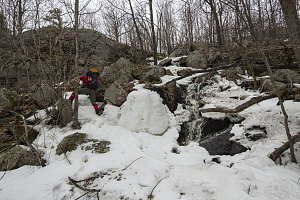 It is also a trail that is not marked on any official Gatineau Park map. We climbed upward, easily following the well-defined path. 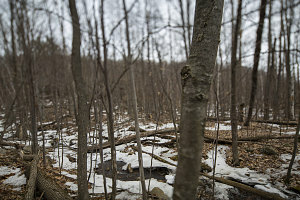 The lower reaches of the escarpment's slopes were already mostly free of the winter's snow. 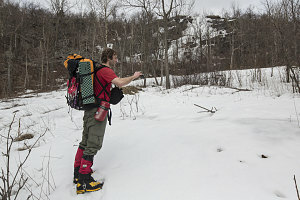 It was only about halfway up the escarpment that the terrain became mostly snow-covered. 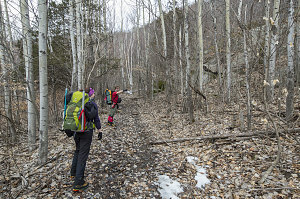 At a point where the trail expertly curved up and to the right, we departed the trail and started a direct bushwhack towards Heffalump, climbing up and over a small ridge. With the lack of leaves on the trees, it wasn't too long before we got a glimpse of the diagonal ribbon of ice that marked Heffalump's location. We arrived at the base of Heffalump about an hour after setting out. 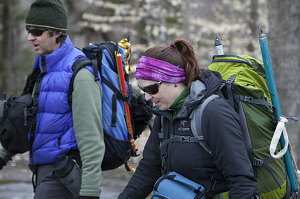 We donned our climbing gear and made ready for a climb. Looking up, we could see an interesting mix of terraces and slopes - nothing particularly hard-looking - above. There did seem to be one main ledge that had a larger vertical section, and Roland suggested that we practice a three-person, two-pitch climb, setting up a belay station on the main ledge directly below the vertical section. 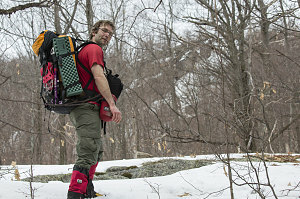 We'd do the climb with our full packs and using mostly mountaineering ice axes (instead of only using technical ice tools). 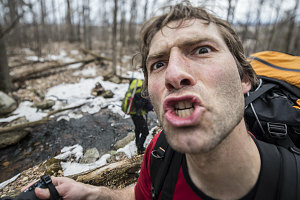 The idea was to try and be more 'mountaineer-y".